Valentine's Day is right around the corner. Even when I don't have a special someone, Valentine's Day is one of my favorite holidays! To get into the fun of the holiday, we have a free printable for you to print and make. The painting you can peek off to the side there is by local artist Black Cat Tips. To make this banner we used a combination of printed out hearts and ones cut out on colored cardstock. The PDF we've included here includes both the printable page with illustrations, and the black and white stencils that you can cut out to make these hearts with colored cardstock. Once you print out your hearts, you can cut them out and punch holes in them for the banner. We used this 1/8" hole punch to punch out the holes. We strung our hearts up with red baker's twine, but you can use any kind of string of twine that you prefer or have on hand. If you're not ready to hand your banner up, you can also store it in an envelope or make one to give to a friend. 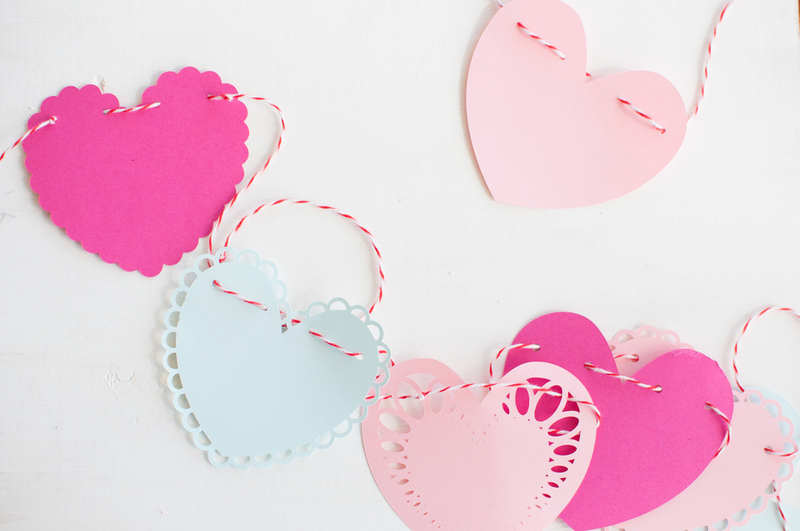 To make our banner, we took the easy route and cut out most of the hearts on our Silhouette Cameo. We've also included an SVG version of our hearts for you to use if you have access to a paper cutter or laser cutter.